Over 150 years of tradition in mechanical and plant engineering, and the modern science and research landscape in the German federal state of Saxony-Anhalt, offer the best growth conditions for the regionally networked peak Cluster “fluidised bed and granulation technology”. In collaboration with Dutch partners from economics and science, international markets shall now be opened up for new procedures and products. Wilfried-Pergande-Platz 1, operating premises of the Pergande-Group in Weißandt-Gölzau in Saxony-Anhalt. In enormous fluidised beds, atomised raw materials are refined into free flowing granulates. At the end of the manufacturing process, every granulate grain of one type is the same size, the same consistency and contains the same quantity of active ingredients. “Our customers include world market leading companies that manufacture pesticides and detergents“, says Professor Mirko Peglow, Technical Manager of the company. “If you think for example that only around five milligrams of pesticides are used on one hectare of agricultural land, then each individual particle must achieve the same effect,” says Peglow. Wilfried Pergande was the founder of the Cologne family company that builds apparatuses and plants for the chemical industry. In 1991, the forward looking entrepreneur came to Weißandt-Gölzau to take over the department of process engineering apparatus construction of the ORWO film factory. Two years later, he had expanded his area of business with the manufacture of turnkey fluidised beds for granulation and drying processes. Until 2015 he invested EUR 100 million into this site near the city of Halle/Saale to build his own fluidised beds. Thereby, the company benefited from the proximity to the scientific location of Magdeburg, Saxony-Anhalt’s capital. Fluidised bed research has a long tradition at the Otto-von-Guericke University Magdeburg (OVGU). Here, Mirko Peglow managed the junior research group for fluidised bed technology NaWiTec. The Pergande group was a highly interested and dedicated partner in economics – and still is today. Granulates can be stored better than liquid or powdered substances. In addition, the product can obtain new characteristics in this manufacturing process”, says Peglow. And that more and more sectors manufacture products that are made up of several active ingredients. Above all, he mentions pharmacy, the manufacturers of pesticides and fertilisers, and the food industry. The Weißandt-Gölzau site is also a development and innovation forum for particle technology. Around EUR 7 million were invested in state of the art testing facilities – primarily made possible by the Federal Ministry of Education and Research. It was convinced of the growing research potential in the area of fluidised bed technology, and promoted NaWiTec at the Magdeburg University, as well as the region growth hub “Wirbelschicht- und Granuliertechnik” [Fluidised bed and granulation technology] – WIGRATEC. Mirko Peglow coordinated this research alliance of twelve small and medium sized enterprises from the region, and the University of Anhalt and the OVGU. All of them use the technical school in Weißandt-Gölzau to develop new fluidised bed process technologies in apparatus and plant engineering, which are then marketed nationally and internationally. “We have worldwide leading competences in this area”, says Mirko Peglow. Reason enough for him and his alliance partner to apply for further funding from the government, within its high tech strategy “internationalisation of top level clusters, future projects and comparable networks.” Recently, there was good news from Berlin: the research top level cluster WIGRATEC is one of eleven applicants nationwide to receive funding for its project “Innovative granulation and drying technologies for the food and feed industry”: EUR 4 million over a period of five years. The Dutch network with 90 representatives from industry and science has long standing experience in the development of new recipes and products in the food and feedstuffs industry, says Andreas Bück. “By pooling our competences, we will develop new manufacturing processes and plants for new products”, adds Mirko Peglow, and thereby looks at the market with the largest growth potential: the agricultural sector. Particularly in the industrial nations, the interest in “functional” foods is growing, which promote wellbeing and health beyond their nutritional value. The conditions on potential new markets such as Asia, Africa and South America also require new processing operations. “For the companies in the research alliance, there is an innovation advantage of the international cooperation, which they could not achieve with their own prospects. In addition, the hurdles to market entry are becoming lower,” says Peglow. After the trial period with the Netherlands as a pilot market, the alliance wants to appear on the global market together, and market both the fluidised bed processes and plants, and the food and feed products manufactured with them. 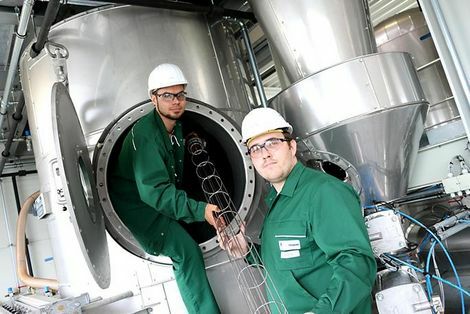 caption: Steffen Kronberg, Head of the WIGRATEC technical school, and Project Engineer Thomas Kathe (from left) install a filter basket into a granulator to clean the process air.